All-inclusive resorts are so very nice because once you pay, you're done baby. Forget about paying more for meals, drinks, entertainment and even tips - just relax and have a good time. I've personally been on 6 all-inclusive trips (5 times to Hedo II and 1 time to Grand Lido/Breezes) and I've very much enjoyed the "keep the money clip in the room safe" concept. The Hotel Riu Naiboa in Punta Cana, Dominican Republic, has a current special starting at a pretty amazing $63 per person, per night, meals and drinks included! Punta Cana, with dozens of all-inclusives along miles of white-sand beach, is popular with Americans as a safe place to travel. Hotel Riu was just renovated this fall and offers over 362 guests rooms spread out over 20 acres of land right on the beach. Hotel amenities include mini-market, pool with children's section, miniclub, complimentary sun loungers, towels and umbrellas by the pool, 4 tennis courts, a sun terrace and free Wi-Fi in lobby. The all-inclusive part of the resort also offers 24-hr snack and beverage services, daily programs for adults and children (ages 4-12), nightly entertainment live music or shows. The renovated guests room includes Air conditioning, ceiling fan, 1 double bed or 1 double bed and 1 twin bed, direct dial phone, regularly replenished mini-bar, new liquor dispensers, satellite TV, in-room safe for free. Bathroom equipped with bathtub and shower, amenities kit. Balcony or terrace. 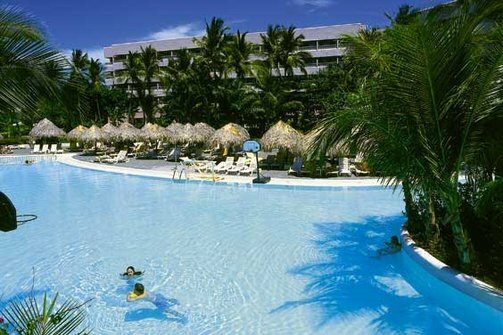 Most of the sale prices are for next month, so if you're down, go here: www.riu.com/punta-cana/hotel-riu-naiboa/offer.